AMMONNEWS - Since the Hashemite Kingdom of Jordan joined the international coalition force to fight against DAESH and restrain the latter’s activities in Syria and Iran, various terrorist organizations have been striving to open the Jordanian front to reduce pressure on such groups. For the past two years, these groups have been trying hard to execute destructive operations and attacks on security forces – the most recent of which were the attacks on the Jordanian intelligence post in Baqa’a and border security camp in Rukban during the Holy Month of Ramadan. These attacks are regarded as added burden on the Kingdom of Jordan, besides the influx of Syrian and Iraqi refugees. On the other hand, King Abdullah II has been exerting tremendous efforts in the past five years to maintain economic and security stability in the country by putting into action creative ideas, projects and programs. Through these efforts, he prevented the negative repercussions of the international economic crisis and the ongoing conflicts on its Northern and Eastern borders. Today, the King of Jordan made a miracle by balancing the Kingdom’s limited ability and the increasing security requirements due to the unusual phase that the region is going through and the high population density. Therefore, the Kingdom, in its capacity as the Northern gate of the GCC region, must enhance its abilities in every aspect in order to prevent the terrorism epidemic from spreading to our countries. This is possible through the continuous success of the King’s miracle. If King Abdullah succeeded in confronting terrorism and vowed to strike with an iron fist anyone who attacks or attempts to transgress the security and borders of his country, he needs support in order to ease the burden on the shoulder of a country with limited capabilities taking into consideration the threats that the Arab world has been facing continuously. If the recent security measures led to the closure of Jordan’s Northern and Eastern for military reasons, it means the frontier is secured. 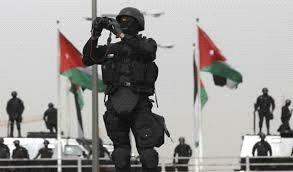 However, this is not enough because Jordan has been in an open confrontation with terrorist organizations. If the GCC countries do not hasten in securing all means of support for Jordan; they will encounter security wrangles caused by terrorist organizations backed by countries known for their evilness, taking advantage of the weakness of the Jordanian frontier to reach to us. If this happens, we will lose our first strategic line of defense protected from aggressions that various axes of evil have been trying to mount throughout the past decades.